While it’s not reading for the faint of heart, it is for those interested in supporting their use of social network learning with learning theory. It certainly contributed to my personal growth and connectivist learning. Enjoy! My students would find it no surprise to see yet another word cloud in my reflection. I love word clouds! They are such a creative, versatile tool that can be used for fun, nonsense, and also as a writing tool like summarizing key concepts. This Tagxedo word cloud may not look like much, but let me assure you it represents hours (DAYS! ), sweat, and tears. It also represents a newly grown knowledge within me, which is really what it’s about in the first place. Specifically, this is a visual representation of my 2852-word synthesis paper draft for EdTech 504. I’ll spare you the math: that’s 8 dense, heavy, scholarly pages, not including 2.5 pages of peer-reviewed references. I don’t think I’ve ever written a paper that includes so-far 21 references. Wow. It’s not called a synthesis paper for nothing. To synthesize is to combine, sort through, fuse, and otherwise make sense of a lot of information. I have read dozens of scholarly journals, articles, blog posts (which aren’t peer re-viewed but provide interesting context), and eBooks. I’ve scoured the APA Style Guide and become good friends again with Zotero. This is not light reading, by the way. It is heavy stuff that includes words I knew little about before starting this course, words like constructivism, connectivism, taxonomy, and epistemology. More and more teachers are using Virtual Learning Environments (VLE) social network learning sites such as Edmodo, Schoology, Moodle, Blackboard, and Canvas. These sites provide a controlled environment where teachers and students interact, post and submit homework, give and receive feedback from their peers, and link to course resources and information. Social network learning, which by the way is distinctly different pedagogically than social networking, is like a walled-garen that helps students learn critical skills while in a safe and controlled environment. Most of us know and love social media, and it is an integral part of our lives. How, then, can this desire to be connected, to be part of something greater than ourselves, translate into the classroom? Should we really require that our students completely “disconnect” when they come to school from their real lives and the tools that are integral to their very existence? My paper supports the use of intentional, planned, purposeful social learning networks to engage students in the classroom. It attempts to “define social network learning and its theoretical connectivist foundations, and provides learning strategies to apply such pedagogy in the classroom.” Basically, it is the why of using social network learning strategies. I look at social network learning through connectivist principles, and explore practical applications such as Virtual Learning Environments, Learning Communities, and Project-Based Learning. I explore traditional learning theories and emerging learning theories (theory or framework debate) and use these to argue the critical need of using social networks in the classroom. I have long been a believer in helping students make connections, of giving them a larger audience, of equipping them with the skills that govern online social behavior while we still have them in our reach. Now I have a basis for this belief, and I’ve emerged with an even greater commitment. Since technology has “reorganized how we live, how we communicate, and how we learn” (Siemens, 2004), shouldn’t we, as educators, be willing to help our students make some sense of it all? Use it? Benefit from it? Connectivism, at its heart, holds that rather than transferring, making, or building knowledge, it is more like “growing or developing ourselves and our society in certain (connected) ways” (Downes, 2007, para. 6). 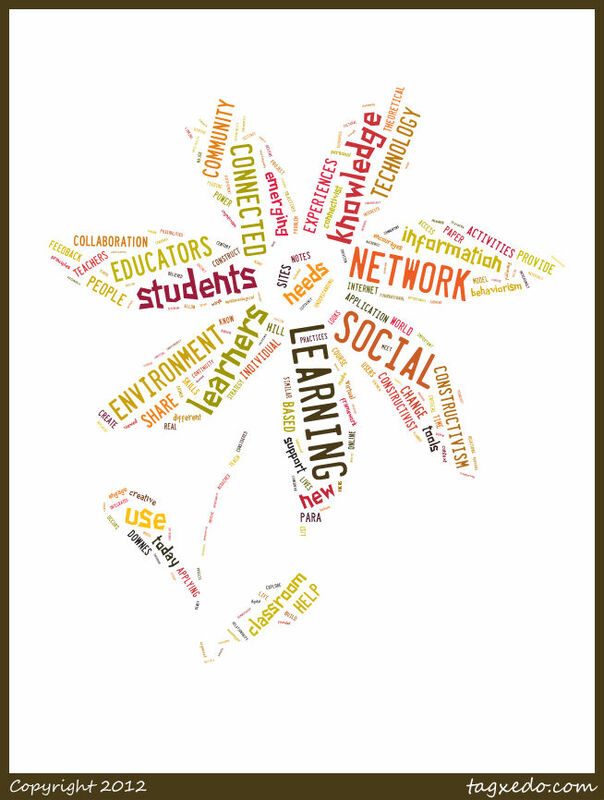 As my word cloud flower proves, new knowledge has certainly grown within me. I find connectivism a most fascinating emerging theory, which is why I chose awhile back to design this Periodic Table of Connectivism for EdTech 543 Social Network Learning that incidentally was picked up and shared on various networks. I am intrigued by the debate on whether connectivism should be considered a modern-day theory or a mere framework for learning. Both sides have strong arguments, but regardless of its status, it “continues to play an important role in the development and emergence of new pedagogies” (Kop & Hill, 2008) and will become increasingly important in learning environments. Connectivism is based on constructivist principles that state learning is not acquired or gained; rather, it is distributed across a network of connections, built, and grown (Downes, 2007). If this is indeed true, and if it is true that “technology has reorganized how we live, how we communicate, and how we learn” (Siemens, 2004), then connectivist principles should be embraced in schools rather than feared. This year at our school teachers are discovering virtual learning environments (VLEs) such as Edmodo and Schoology. While we use Google Apps heavily, many teachers are finding that they really like the collaborative communication that VLEs provide. Students comment and give feedback, ask questions, and otherwise engage with the content and each other. This sort of connected learning is a fundamental principle of connectivism. I certainly want to include a more connectivist approach in everything I do. For example, I’m about to have the younger grades create their first eBook and then share and comment on each other’s. I anticipate that they will really like this activity because they will learn something new from a classmate and be able to comment on it. Just because a learning theory or framework is complicated doesn’t mean teachers can’t incorporate some basic principles in their pedagogy. While I have yet to really get a handle on connectivism, I do intend to have my students continue to reach out to each other and grow their learning. Not only did I find, read, summarize, and cite such resources from peer-reviewed sources, I wrote a short paragraph on each one. Lest you think that is simple, let me explain. This paragraph is much more than a summary or abstract of the article. It is a critical analysis of its purpose, a comparison to other works in the field, an explanation of how it fits into my taxonomy, and requires my personal conclusions and observations. In short, the annotated bibliography is no small feat, as you may surmise from its title Selected Research on Supporting Theory and Frameworks for Social Networking: An Annotated Bibliography. In plain English, I chose to dive into the framework and theory that supports using social networking in education. I knew social networking is fun and engaging for students. Schools use sites such as Facebook, Twitter, Edmodo, and Schoology to help students collaborate and connect. What I didn’t have a handle on before now is the research supporting such practice. Eight long resources later, along with several other course resources, I now do. Social Networking is much more than a fun way to socialize. The Internet, though not initially designed as such, has become a social experience focused more on relationships than information or content (Lankshear, 2000). Depending on how well it is integrated into course design, social networking can engage learners and foster better retention (Jonassen, 1991). I have seen this as I’ve assisted in my school’s 9th Grade Understanding Computers course. The teacher chose to use Edmodo as a learning management system and I am impressed at how well the students have embraced this format. The students always know what is coming, what is due, where they stand, and have all course materials easily at their fingertips. Comments and feedback are integrated throughout and they have responded well to the social nature of this course. According to Boitshwarelo (2011), the versatility of the online environment is an excellent medium to explore the growth and facilitation of key concepts of the connectivism theory. Social networking is supported by select learning principles from other learning theories such as behaviorism, where the learner is reactive rather than active in creating knowledge. Anyone who has sat back and caught up on current events or sporting event outcomes by reading their Facebook news feed can relate to this idea. I think time will tell how social networking will impact long-term education and achievement, but there are some exciting possibilities that teachers can use now help engage their students in learning. Boitshwarelo, B. (2011). Proposing an integrated research framework for connectivism: Utilising Theoretical Synergies. International Review of Research in Open and Distance Learning, 12(3), 161–179. paradigm? Educational Technology Research and Development, 39(3), 5-14. Lankshear, C. (2000). Information, knowledge and learning: Some issues facing epistemology and education in a digital age. Journal Of Philosophy Of Education, 34(1), 17.